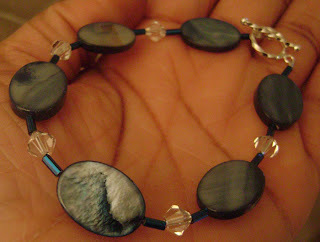 I think that my bracelet making period has a lot to do with the clearance sale that A.C. Moore is having on beads. I've had the Swarovski crystals in my stash for a long time (since the days when I used to sell stitch markers to yarn stores), and I've been looking for something to do with them. I think they've found a good home. I keep looking at this bracelet because I really like it. The bling from the crystals is hypnotic. I'm also in love with the various blues in the beads. I SO want earrings to match, but I don't have silver earring hooks. I have to put that dream on hold until another day.